supplier and provider for lightning surge protection, smart home solution, capacitor bank, water heater electrocution protection, Smart ELCB, and auto recloser in Shah Alam, Selangor, Kuala Lumpur, KL, Malaysia. Safe Sense Solution Specialist was founded in 2010 by 2 Electrical Engineers with more than 10 years experiences in similar field. As usual, the lightning surge protection solution providers are eagerly tapping on the mega projects with high profits, but the residential houses with limited budget were left unattended. This has created a perception that lightning surge protection solution is expensive. 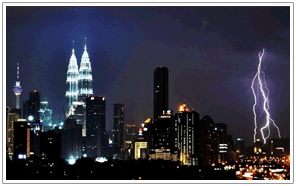 As the result, more than 99% of the residential houses in Malaysia are not equipped with lightning surge protection despite the fact that Malaysia is one of the countries with highest lightning densities in the world.